While Loïc Dewavrin’s farm about 160 kilometres from Ottawa has just 20 hectares of sunflowers, when they bloom the sight stops traffic on Highway 20. OTTAWA — Even the most devoted local-food enthusiasts usually have a short list of foods for which they make an exception — lemons, salt, cinnamon and other key ingredients you won’t find around here. Olive oil is usually on that list, though, increasingly, local restaurants are offering canola oil from the Canadian Prairies, rather than olive oil from Europe, to dip your Art-Is-In bread in. But a few local-food devotees have discovered liquid gold: high-quality, organic sunflower oil from just this side of Montreal. Les Huiles d’Amérique comes from Les Fermes Longprès, a 600-hectare farm near Les Cèdres, which is between Highway 20 and the St. Lawrence River, just west of Montreal. The sunflower oil is made by Loïc Dewavrin, who runs the farm with one of his sons, two brothers and their parents. Is it within 100 miles of Ottawa? By road, the farm is about 160 kilometres from Ottawa, which is nearly exactly 100 miles. But it’s closer as the crow flies, which is how the radius-distance tool works at 100milediet.org. How long has this farm been going? Dewavrin’s parents bought the farm 33 years ago, when they moved to Canada from France. They’re now in their mid-70s and, one at a time, their sons, two of whom have degrees in agriculture, have moved to the farm to take over some of the responsibilities. Loïc Dewavrin, 47, who is an industrial engineer by training, was the most recent, moving onto the farm 15 years ago and adding sunflowers to the crops of soy, wheat, corn and buckwheat. How much of the farm is devoted to sunflowers? Just 20 of the 600 hectares are planted with sunflowers, but the fields of large yellow blooms still stop traffic. “It’s really a wonderful sight,” says Dewavrin. 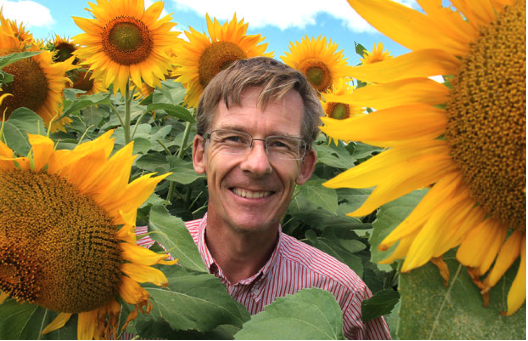 “Now that we have sunflowers up beside Highway 20, people stop their cars to see them,” says Dewavrin. The sunflowers were at their golden peak a couple of weeks ago. Now they’re starting to lose their petals. They have to dry on their stalks for about another three weeks before the seeds are harvested. Are the plants still beautiful when they’re harvested? “No, no, they’re really ugly,” says Dewavrin. And then he makes the oil? How many sunflowers does it take to make a one-litre bottle of oil? What does his oil taste like? Both True Loaf and Janssen sell it for $15 a litre; Janssen also sells half-litre bottles, for $8. “It’s comparable in price to extra-virgin olive oil,” she says. Where can I buy this oil? – True Loaf Bakery, at 573 Gladstone Ave., started buying it in bulk to oil the buckets where the bread rises. But Yael Matte, who runs the bakery with her husband Patrick Graham, says they were so impressed with the oil, they started selling it by the bottle. – Anne Janssen, who calls herself an urban farmer, sells the oil on Saturday mornings from the porch of Boulangerie aux deux Frères, at 146 rue Principale in Aylmer. Or you can contact her directly. Loïc Dewavrin’s 22-year-old daughter, Valentine, opened a café called La Petite Cuillère at 3603 rue St-Denis in Montreal last weekend. She’s using her dad’s oil in her cooking and selling bottles of it too. Can I buy the oil directly from the farm? There’s no shop at the farm, but if you call ahead, you can arrange to buy the oil from Dewavrin. If you stop by the farm to pick it up, you can get half-litre bottles for $6.50 each, one-litre bottles for $12 each (he encourages you to bring your own refillable bottle) or a box of six one-litre bottles for $60. “Or some families go together and buy it in bulk,” says Dewavrin. A 20-litre pail costs $120. Call 1-450-452-4559.